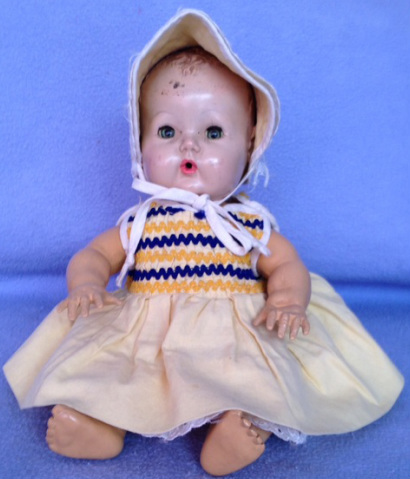 Dy-Dee is an Effanbee doll produced from 1933 through at least the 1950's. 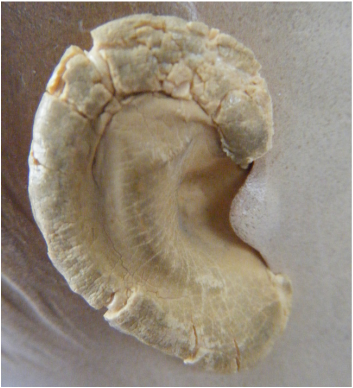 During that time period it was produced from various materials. 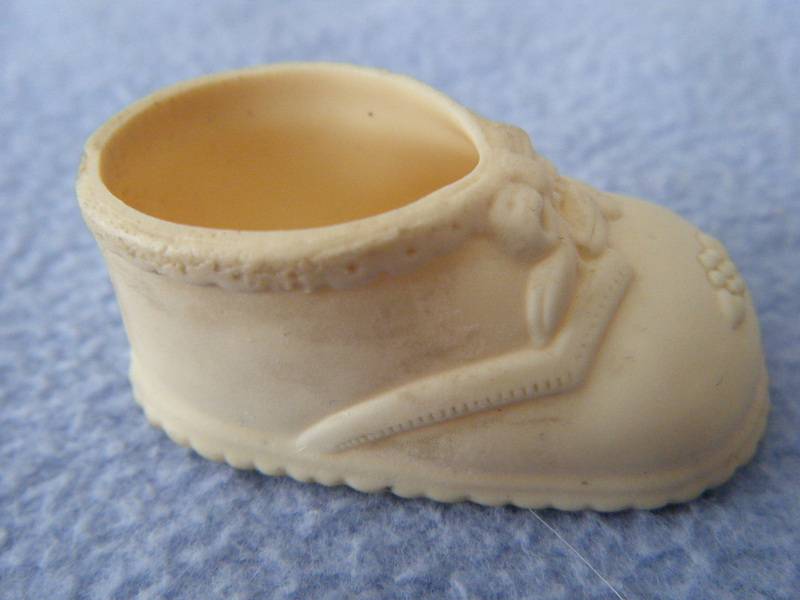 Some consider it to be the first practical drinking and wetting doll because of its hard rubber head. 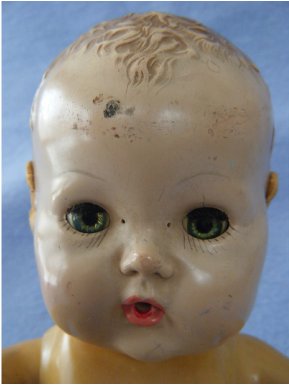 Composition doll heads would be damaged or destroyed by exposure to liquids. It was advertised as "The Almost Human Doll". Tonner made a reproduction using modern materials in 2004. The ultimate resource on Dy-Dee dolls is "Effanbee's Dy-Dee: The Complete Collector's Book" by Barbara Craig Hilliker put out by Reverie Publishing Company (copyright 2004 - ISBN 1-932485-16-3). This particular doll has nothing wrong with it other than normal aging. It is included on this site because it has a story; a story that shows the impact that toys can have on our lives. 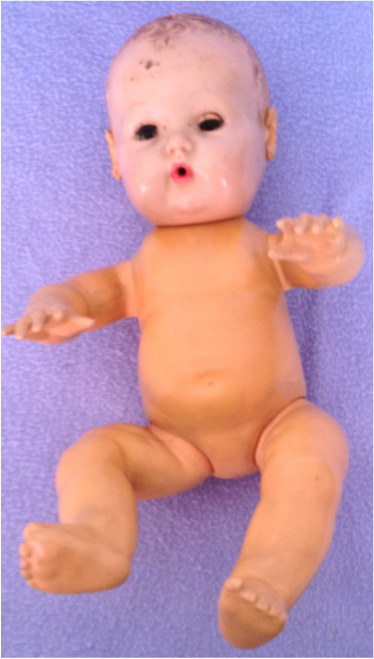 My eldest sister received this doll as a gift after my second eldest sister was born in 1956. My eldest sister was three and half years old at the time. The doll was named after the second sister. My sister has cherished and displayed this doll her whole life. In addition to the doll connecting her to her sister, the doll is special to my eldest sister because it connects her to our mother and both grandmothers as well. My maternal grandmother purchased the doll at a Hudsons department store in downtown Detroit. The doll came with a diaper, a T-shirt, and a bottle. 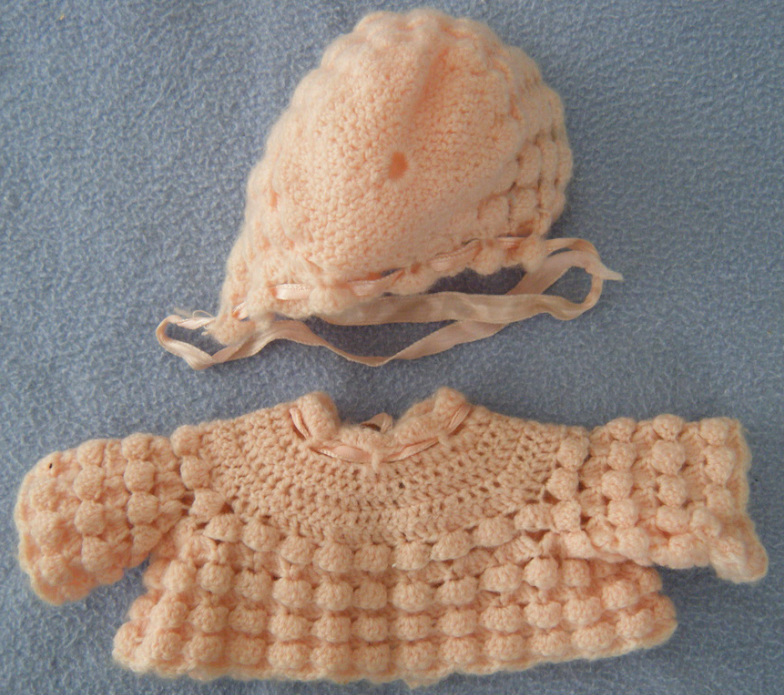 My paternal grandmother crocheted a beautiful outfit for the doll that matched the outfit she crocheted for my second sister. 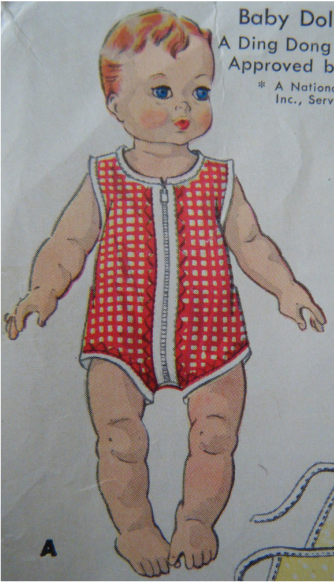 My mother used a McCall's pattern set to sew clothes for the doll. Many of the outfits she sewed by hand or went to her mother's house to use her sewing machine as she did not have one of her own. My sister would dress her baby doll, put her in her baby carriage, and stroll up and down the block with our mother pushing our sister in her carriage. 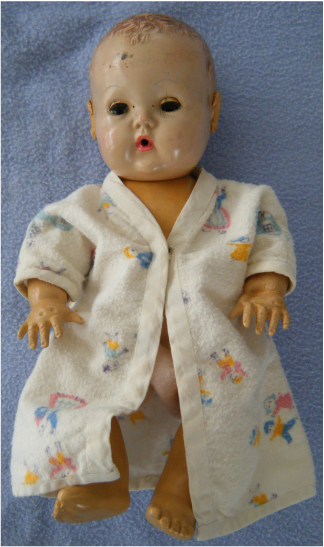 After conferring with our mother we found out that she owned a Dy-Dee doll when she was a girl. She believes that she received it for Christmas in 1935. 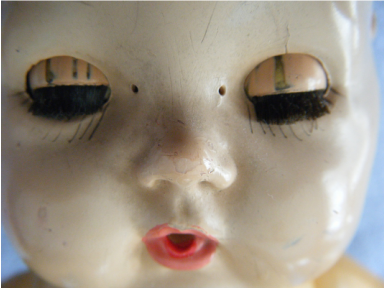 She named her doll "Jane" and she was a composition doll with molded hair. Her aunt made all the clothes for Jane. My mother believes that her aunt was such a skilled seamstress that she took measurements from the doll and came up with her own patterns. 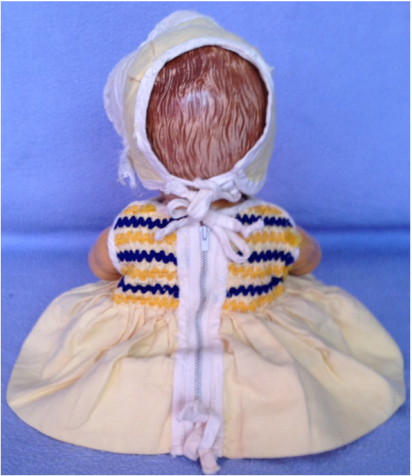 The discoloration of the doll is not due to dirt and will not come out with cleaning. 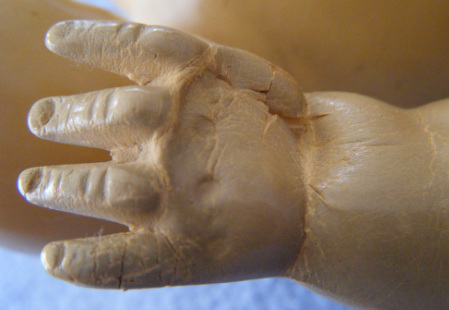 It is part of the normal aging of older rubber dolls. Notice the drinking hole in the mouth. Hard rubber heads were much better suited to being exposed to liquids than the previous generation of composition heads. This is as clean as the doll's face gets - age spots are pretty obvious. Dy-Dee dolls could come with soft rubber ears. This made the ears more life-like. 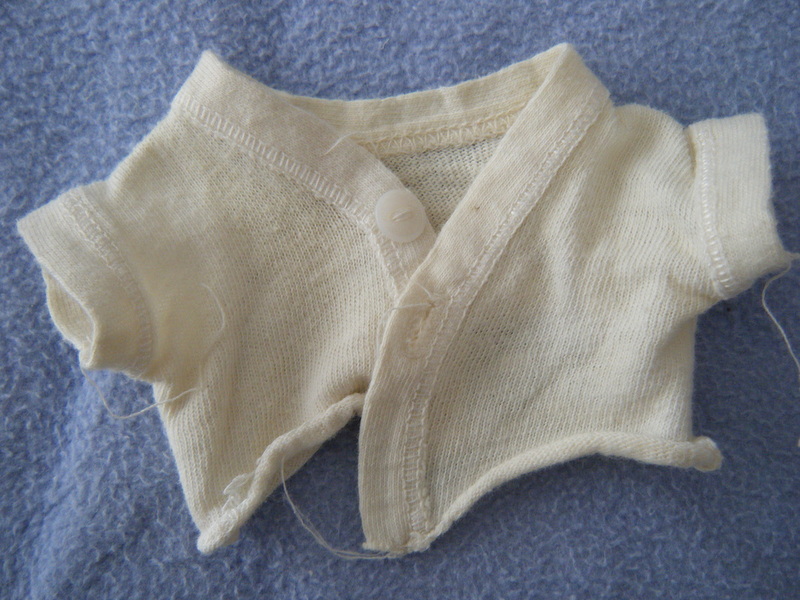 Layettes for the dolls would include Q-Tips so that the young mother could practice cleaning ears. Unfortunately, the applied ears have not aged well on my sister's doll. The right hand is showing some deterioration. 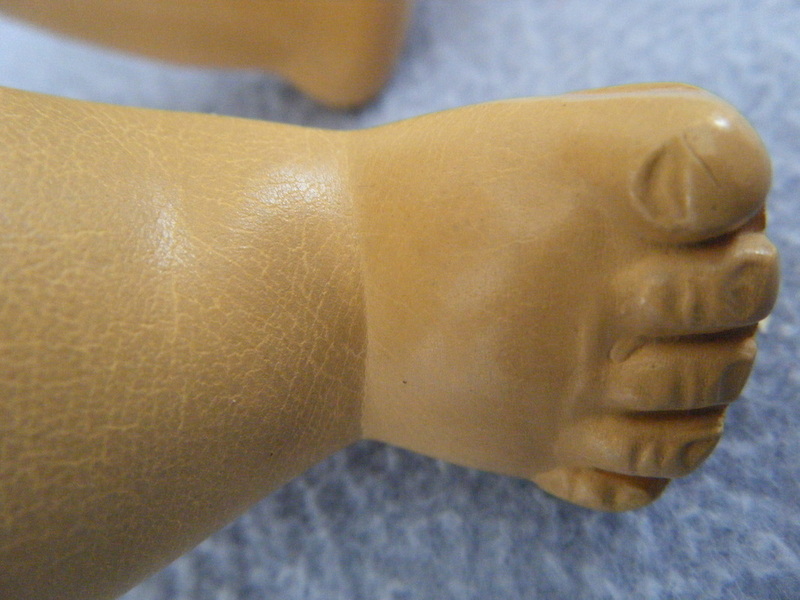 Close-up of the right foot - also showing signs of age. Dy-Dee is an early wetting doll. 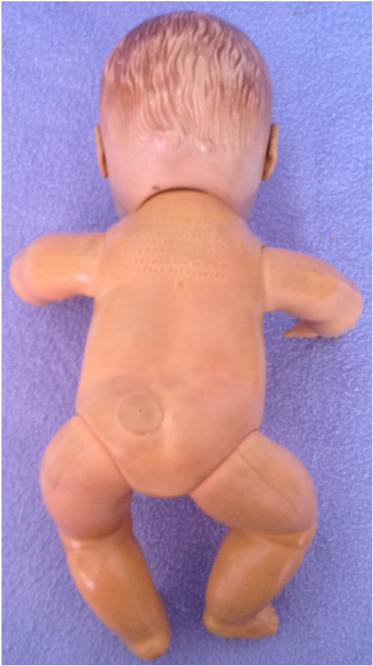 It is interesting to note that the wetting area is off-set from the centerline of the doll and seems to be a plug or insert of some sort. My sister believes that the doll is in good shape today because she didn't make it wet very often - she would have to get permission from our mother. This close-up shows several things: the drinking mouth, the tear ducts, and rub spots on the eyelids. 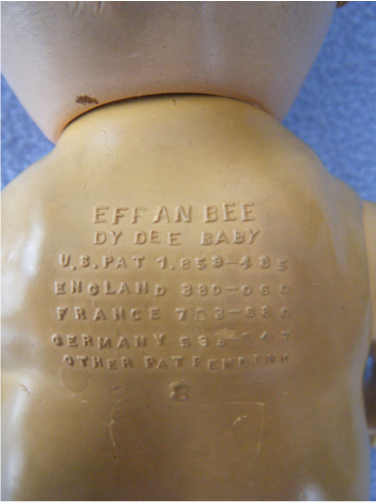 Effanbee patented the doll in the U.S., England, France, and Germany. The "8" is probably for the body mold. The doll is 11" tall. 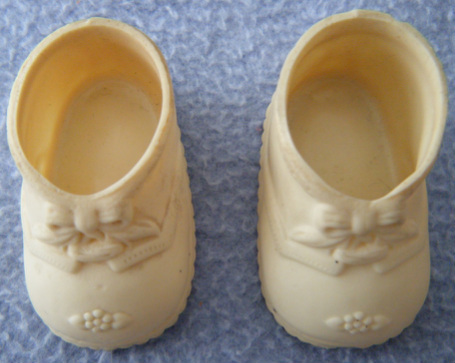 Dy-Dees were quite popular and came a variety of sizes. The left hand is beginning to crumble. There is really nothing that can be done to restore it. Here is a close-up of the wetting hole - which is a plug inset into the body. 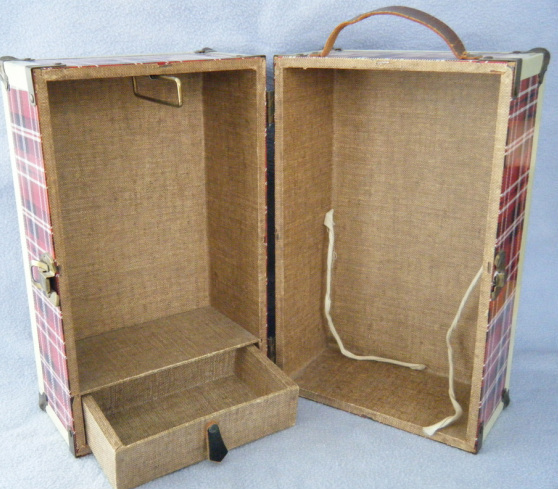 Many Dy-Dee doll's came with layettes - which could be combination bed and trunks filled with high quality manufacturer's clothing and baby care supplies. My sister's doll did not come with one so she adapted another case for that purpose. 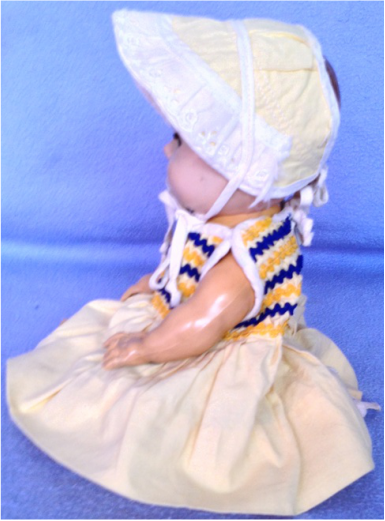 Today, collectors are most often interested in finding the clothing that manufacturers included with the doll. 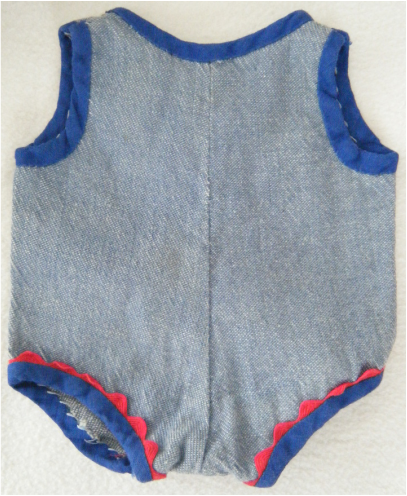 However, many of the original owners have special, and fond, memories of homemade clothing. The owner may have made the clothing herself but in many cases the clothing was sewn by older sisters, mothers, aunts, or grandmothers. 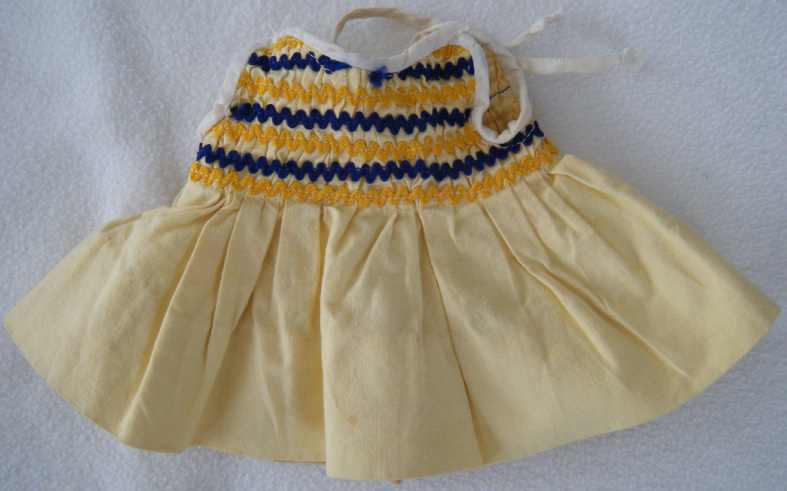 Handmade clothing could mirror the prints and styles worn by the doll's owner. Clothing would be given on special occasions, such as birthdays, Christmas, and Easter. Custom embroidery, lacework, crocheting, and knitting harkens back to an era when needlework was both an essential skill and an art form. My sister's doll came with this little shirt - a standard Dy-Dee piece. 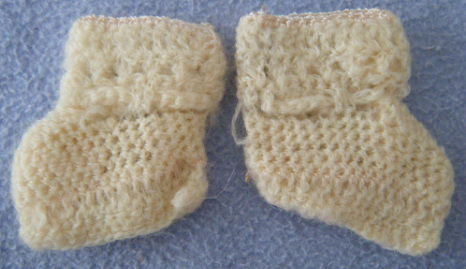 The doll also has these little booties. We are not entirely sure, but think they are original to the doll. 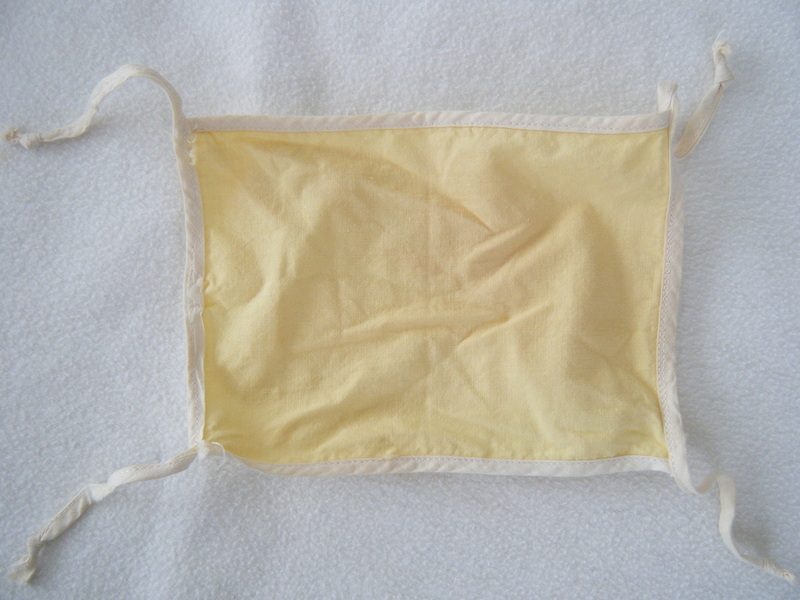 This diaper may also be original to the doll. 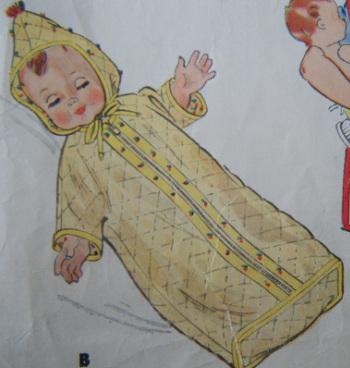 The McCall's pattern is #1900, copyright 1964, cost 35 cents, and was intended for dolls that were 11" to 11.5" tall - including Tiny Tears, Dy-Dee or Kathy. 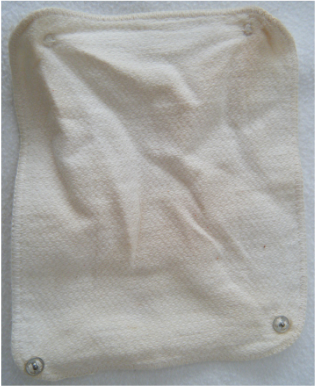 The flap of the pattern envelope contains a message from Miss Francis of Ding Dong School, an iconic educator of the period. 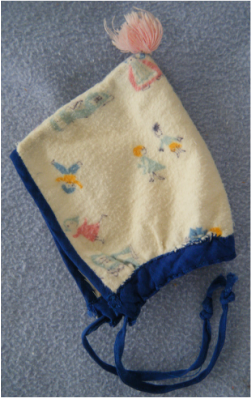 The flap says, "This Ding Dong School pattern was developed for use by parents and children with the aid of America's most popular television teacher - Frances Horwich. Her NBC program "Ding Dong School" is seen by more than 6 1/2 million viewers daily and has won many top awards. 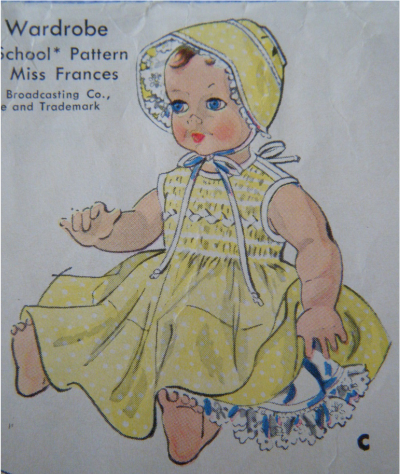 You will enjoy making and using this pattern which is approved by Miss Frances." 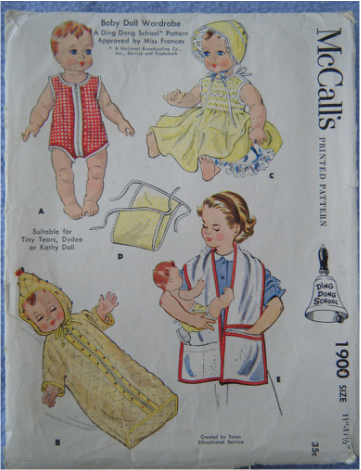 McCall's produced patterns for many of the most popular doll sizes. 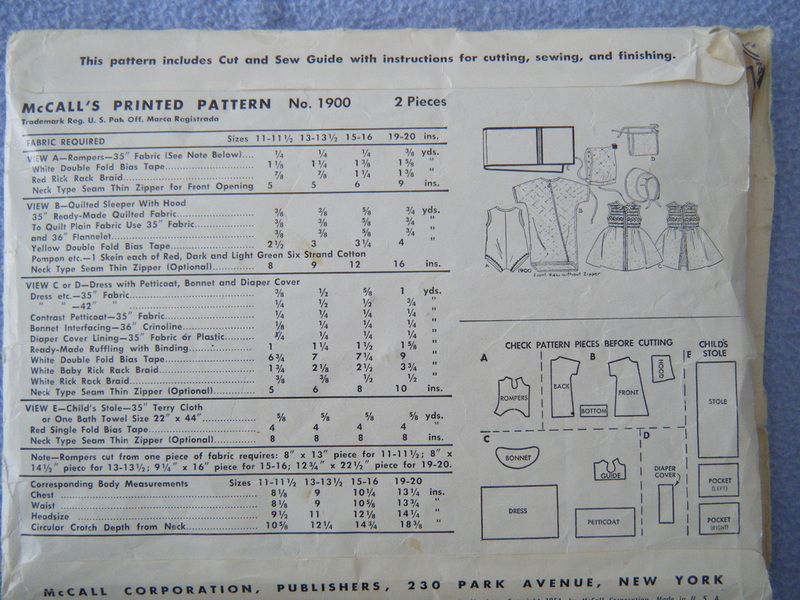 This is the actual pattern set that my mother used to sew the clothes for Dy-Dee. The handbell on the side was Miss Frances Ding Dong School logo. 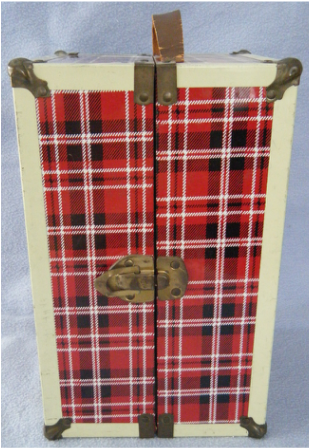 Anyone who was a child in the 1950s or 1960s will recognize it at a glance. This dress was sewn by my mother. 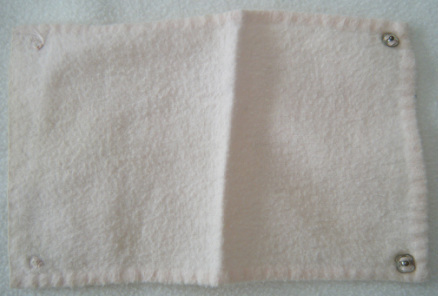 It used the pattern (C) shown in the upper right corner of the pattern envelope. Notice the pleats on the dress. 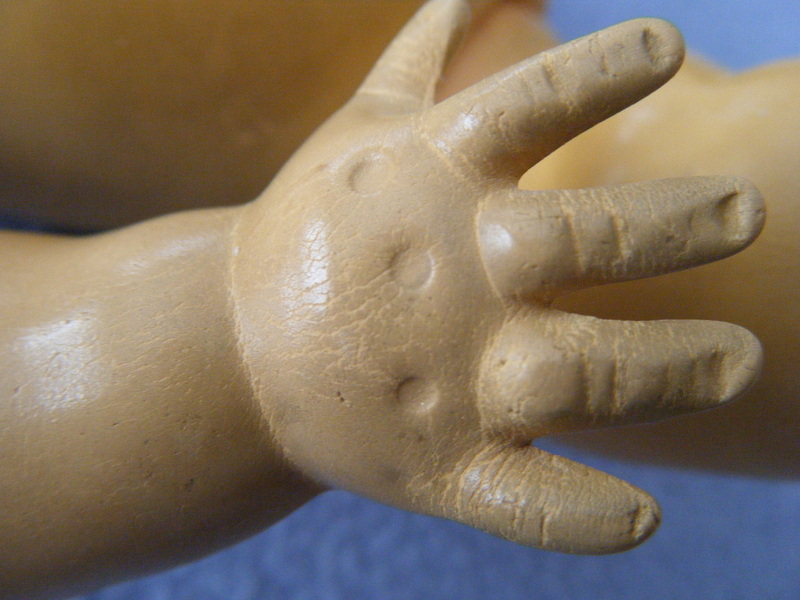 A bit of lace can be seen peeking out by the doll's toes. Here is a better view of the lace edged slip. 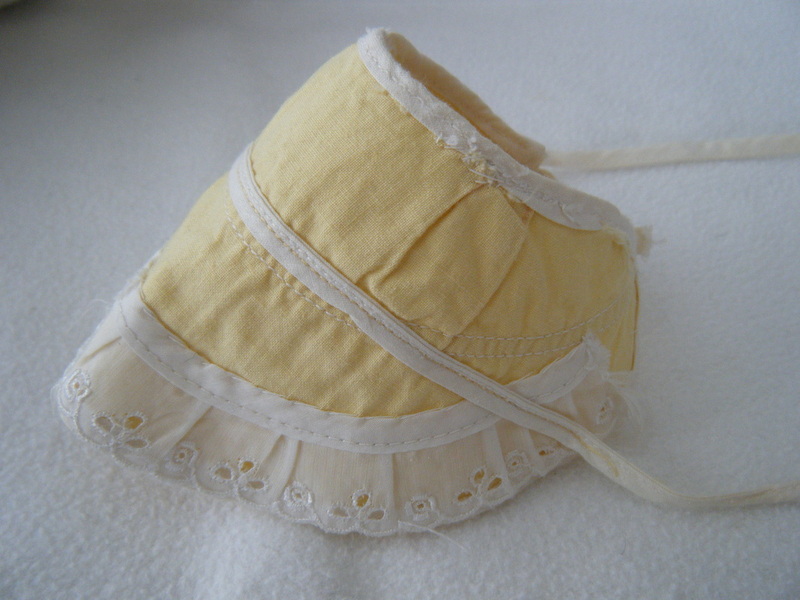 The piece at the bottom of the image is not a bonnet but rather a diaper cover. It's materials would be chosen to coordinate with the main outfit. 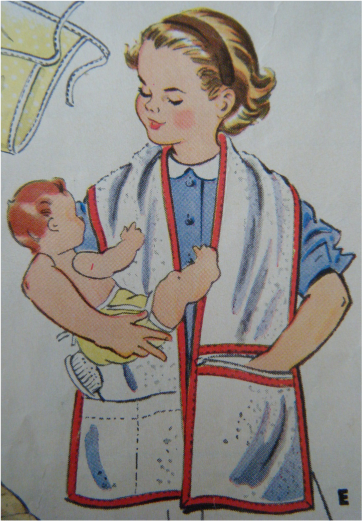 This was long before the age of disposable diapers. 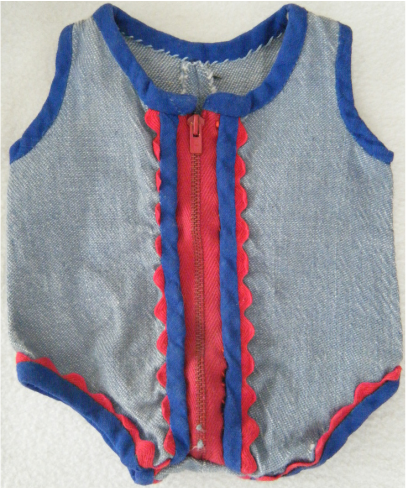 The zipper is period and predates the ubiquitous velcro fasteners of the present day. The side view shows the detail of the bonnet very well. 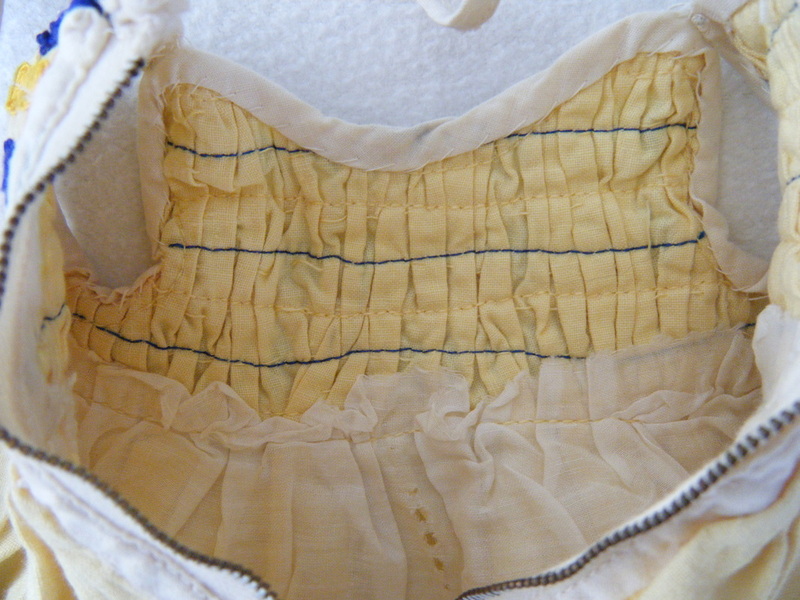 Here is a better view of the zipper and smocking inside the dress. 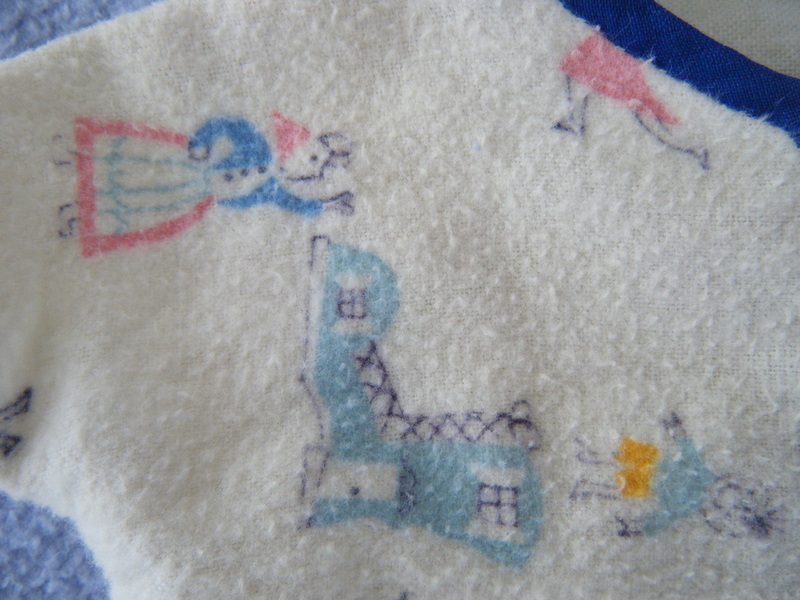 My mother also made a set of "Old Woman Who Lived In a Shoe" nightwear from flannel using pattern (B) in the McCall's pattern set. Snaps are the fasteners used on this piece. Close-up of the "Old Woman Who Lived in a Shoe" print. 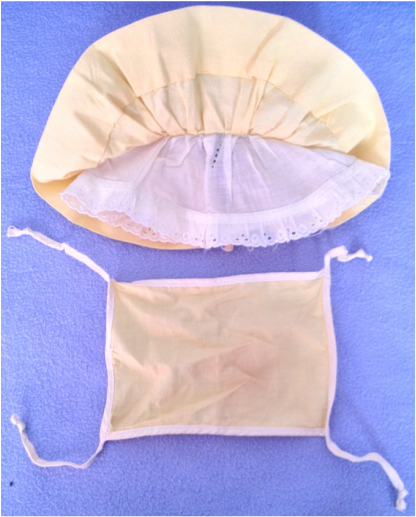 The home-made bonnet to accompany the nightwear. 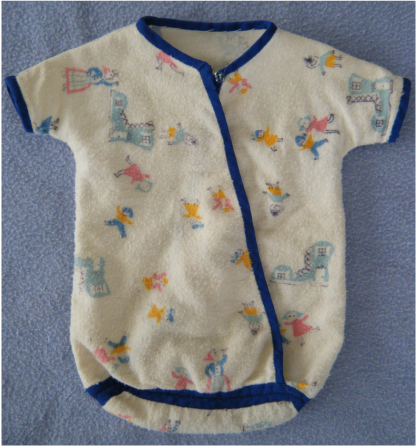 This piece completes the outfits made by my mother from the McCall's pattern set (A). 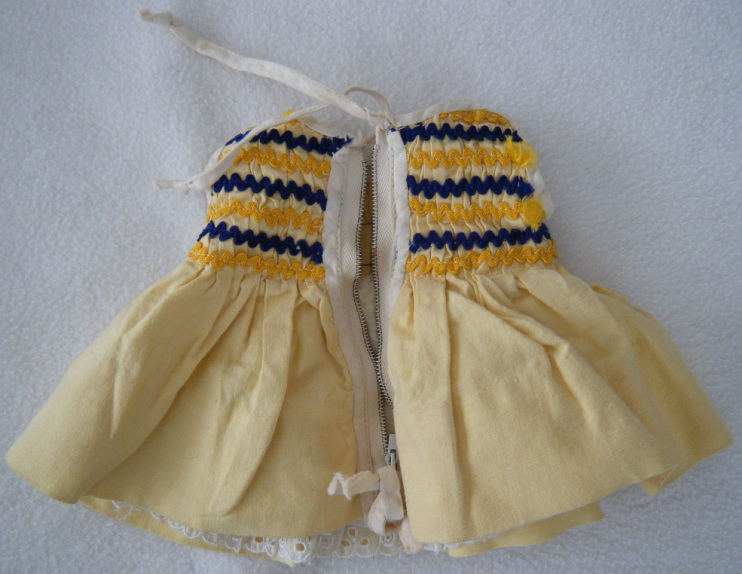 One of my sister's most prized possessions is an outfit crocheted by our paternal grandmother. 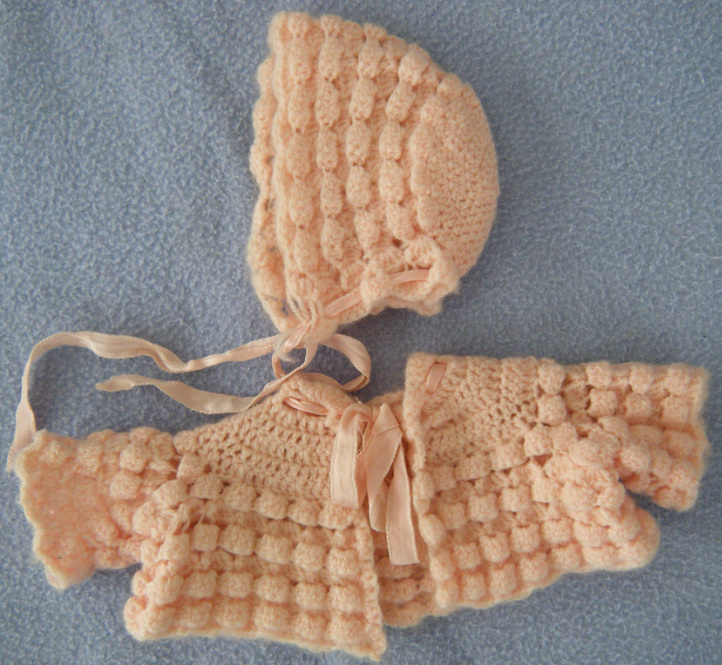 This outfit was created to match the one my grandmother crocheted for our second sister. Back of outfit crocheted by my grandmother on my father's side. 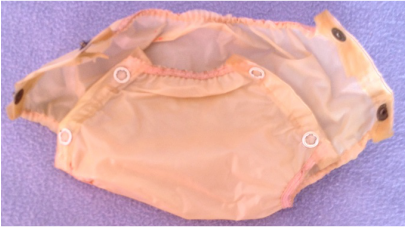 One of the accessories that my sister keeps with the Dy-Dee doll is a pair of plastic pants that would have been worn over a cloth diaper to prevent leakage. The elastic bands and snaps on these pants have withstood the test of time. It is very hard to find these in this condition today. 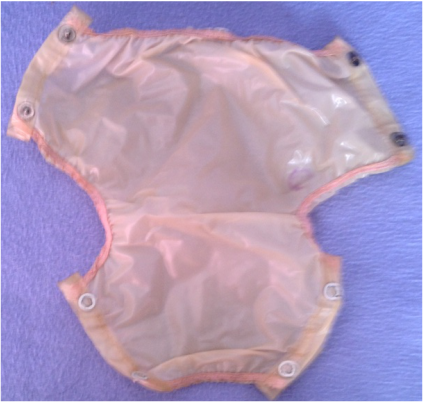 Another view of the plastic pants. The purplish circle on the right hand side near the center crease is where the price was stamped on the pants. Unfortunately the markings have become unreadable but my sister believes it may have read 10¢. 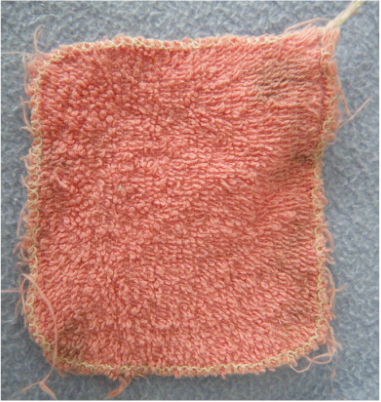 A wash cloth for keeping Dy-Dee clean. 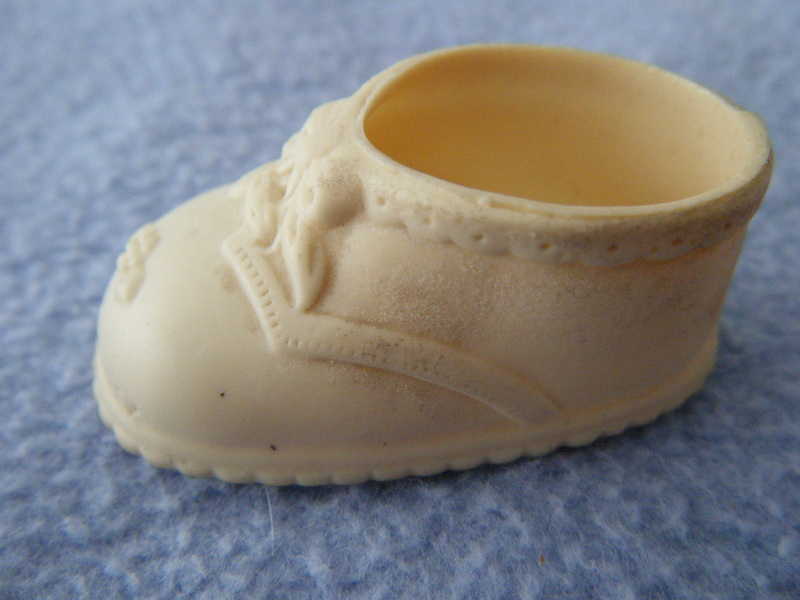 These shoes are not original to the doll, but they have been with the doll from early on.